Everyday Hands is a Rochester-based company that gives individuals and business an extra set of “helping hands” in a variety of situations. Whether you have an aging parent who needs companion visits, need hosting a corporate event, or are looking to de-clutter your home, Everyday Hands is the company you want to call! As we started our marketing work with Everyday Hands, the largest-impact marketing opportunity we identified was improving the website experience for their current and potential customers. The original website was not responsive (didn’t work well on mobile devices), contained outdated information, and did not portray the professional quality of Everyday Hands and their staff. 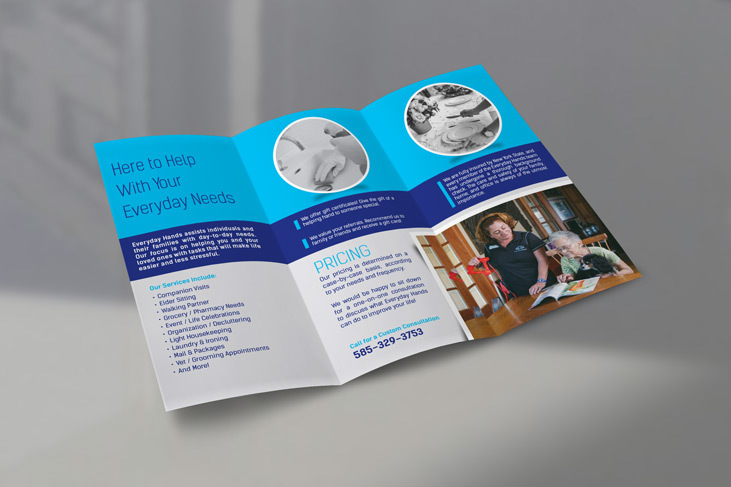 Everyday Hands general service tri-fold brochure. We began our website work by walking the client through how domain registration, renewal, domain name systems (DNS), website hosting, and email services work. It’s important to us that our clients understand these processes and how they are related. This allows our clients to make the most informed decisions about their websites moving forward. During this discussion, we discovered that Everyday Hands’ previous web developer had been responsible for registering their domain and setting up the website hosting. The developer had listed their own personal information on all of the accounts, and never turned access, passwords or ownership over to Everyday Hands. This meant that neither we, nor Everyday Hands, could manage or make updates to the website, the hosting service, the domain name, or their email accounts. Sorting out the account ownership issues became our top priority. No matter what marketing work we do with or for our clients, it’s important that our clients have full ownership of their critical business assets, such as their domain, hosting, and email services. Some domain registrars have a process in place for claiming ownership of a domain if you are not listed on the account, but these processes are long, cumbersome, and often come down to a single person at the domain registrar making the decision one way or the other. This verification process is needed to ensure that random individuals aren’t able to claim websites for business they do not, but they are not foolproof methods of reclaiming a domain. At the end of the day, if you aren’t listed on the account, you run a high risk of losing control of your accounts for good. Unfortunately, Everyday Hands’ original web developer was completely unresponsive to their requests to claim the accounts, and after several months of efforts that ranged from petitioning the domain registrar, to going to domain auction / back order, the client was unable to gain ownership of their original domain. 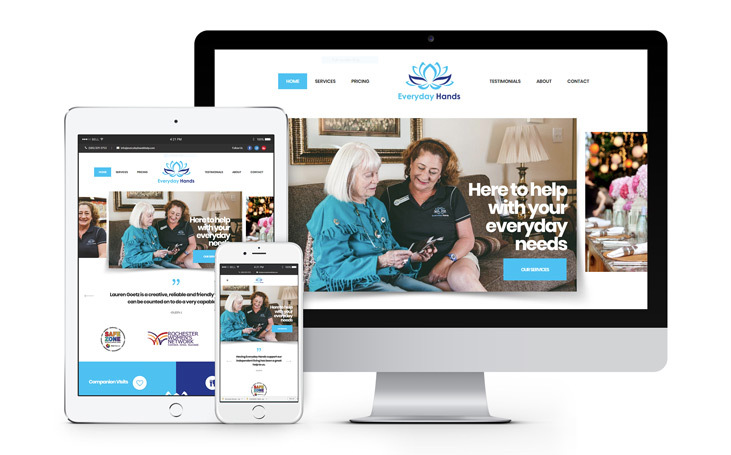 This meant Everyday Hands was forced to select a new domain, update all of their marketing collateral (including business cards, tri-fold brochures, social media accounts, etc), update their email address with all of their clients and vendors, and create a new website. The new website with mobile responsiveness. With this frustrating setback behind us, we moved on and helped Everyday Hands choose and register their new domain (in their own account! ), set up new hosting, transition their email accounts to the new domain, update their marketing collateral, and launch a brand new website that took advantage of newer technology and an improved customer experience. 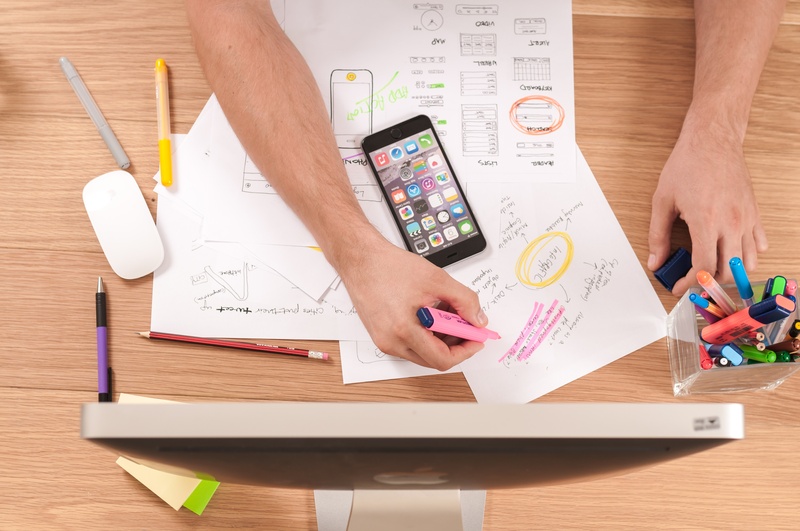 Although we wish Everyday Hands could have reclaimed their original domain, the experience serves as a reminder about the importance of working with professionals who have your businesses best interest at heart. If your unsure of who is listed as the owner of your domain, that’s a sign that you could use a consultation with us! It’s quite often we hear that an office manager who left 2 years ago, or the neighbor’s kid who’s now off at college helped to do it, and that can put your company in quite the bind should you need to make changes (or even renew it to keep the status quo). We can help you track down those details, ensure your accounts are set up correctly, and even make recommendations for the safety and security of those accounts long term. Get in touch with us today!